If you find yourself lost upon your arrival to Marrakech, just look at the locals with a lost face, you'll see that they will automatically point you towards the jemaa el-Fna square, without a doubt, the very centre of Marrakech. 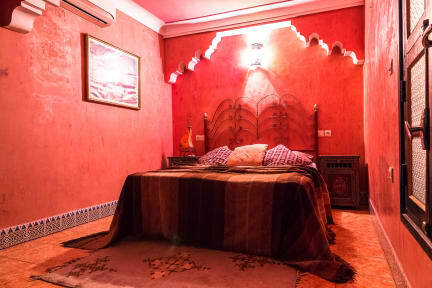 Barely 200 metres away, La Casa Del Sol Marrakech hostel appears like a sanctuary for travellers, with 4 bed dorms, doubles; twins and singles rooms. No detail or decoration has been forgotten. please note that we have FREE WIFI access. Its rooms have full bathrooms and exquisite furnishings, sofas, cushions, mirrors and paintings. many beautiful common areas have provided to unwind from the frenetic pace of the city whilst getting to know people from all over the world. At night you will be able to enjoy the peace and silence of the Riads’ softly lit inner courtyard, or if you prefer, stay in the amazing rooftop terrace while enjoying a fresh drink or refreshment mint tea. our expert Moroccan cook, can prepare you amazing traditional meals. Moroccan Views the owning company has put all its experience into the design of this hostel/guest house to set the standard in the city for travellers who are searching for a unique and authentic experience. Its rooms have full bathrooms and exquisite furnishings, sofas, cushions, mirrors and paintings. a beautiful common areas have provided to unwind from the frenetic pace of the city whilst getting to know people from all over the world. 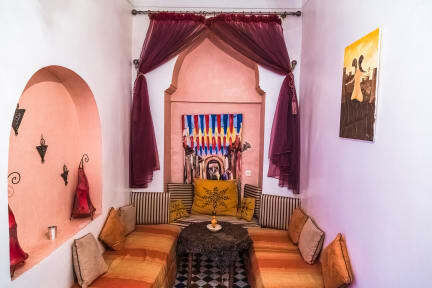 At night you will be able to enjoy the peace and silence of the Riad's softly lit inner courtyard, or if you prefer, stay in the amazing rooftop terrace while enjoying a fresh drink or refreshment mint tea. our expert Moroccan cook, can prepare you amazing traditional meals.